In late 2013 I posted an article about the splendid mosaics that decorate apartment blocks and public buildings in Uzbekistan. Many buildings from the late 1960s, 1970s and 1980s were richly and elegantly decorated in mosaics depicting Uzbek themes, heroic workers, floral and geometric patterns. Highly-skilled artists were commissioned to design the panels and the cityscape of Tashkent, in particular, became notable for these marvellous works. One of my favourite pastimes in an Uzbek city is roaming around the suburbs discovering these decorations. My hope is that an Uzbek photographer will document this social history before it is too late. Here are some more of my favourite examples. This marvellous heroic worker piece above takes up an entire wall in suburban Samarkand. As well as showing men and women working for the Soviet state, there are domes and Uzbek details included in the piece. Immense mosaic in central Tashkent, richly decorated with Uzbek motifs. This large mosaic above decorates the entire wall in the centre of Tashkent. 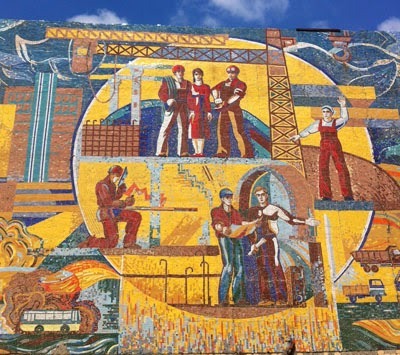 It is behind the Tsum department store, on Taras Shevchenko Street, adjacent to a public school.The image celebrates the family, cotton (Uzbekistan's "white gold"), the rivers and the sun. At left is a detail from a bus stop in the Shakrisiabs region, on the way to Katta Langar. Sadly it is in poor condition, yet still retains a faded loveliness. Perhaps the countryside was once dotted with such marvellous bus stops? When you are in Uzbekistan, it is easy to be dazzled by the superb Islamic monuments with their rich, turquoise tile work. But do take time to notice other architecural details that decorate both public buildings and apartment blocks. The craftsmen who created them were indeed masters. From time to time I will publish more images of Central Asia's architectural decorations.